I suspect 10,992 of those visits were you! kevinchess1 wrote: I suspect 10,992 of those visits were you! How good are you at counting...? M and S to close or convert to food only shops. Wonder if ours will survive? The Great Yarmouth one went some years ago and was replaced with an out of town food only store. No idea what happened to the Yarmouth shop but both here and there M and S have/had very big shops. I know it took years for the even larger Co-op shop in Yarmouth got taken over, as far as I can remember the space was split into various shops. But in both towns the space occupied would not be suitable for that solution. And I suspect many of the shops to close are in a similar position. 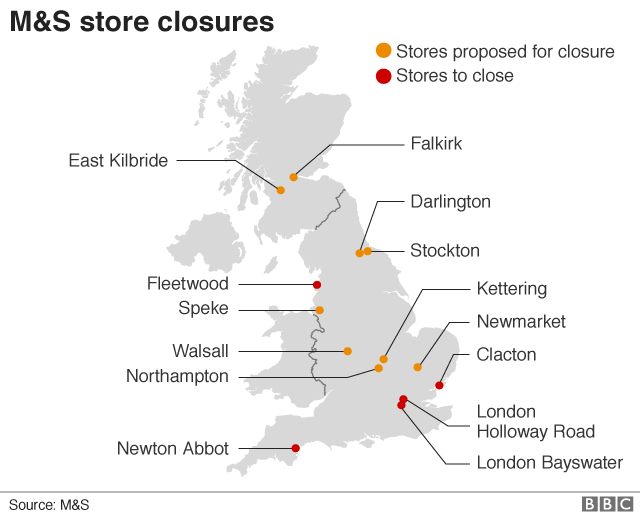 blythburgh wrote: M and S to close or convert to food only shops. Wonder if ours will survive? The Great Yarmouth one went some years ago and was replaced with an out of town food only store. They are saying they will close 100 stores over the next four years, (up to 2022) They do not say how many they will open in that period. They are continually opening small food only stores in out of town trading estates and also adding to their Joint venture with BP. Not sure how that will work for the long term as garages adapt to the movement of people to Hybrid/Electric vehicles. It is true that they are moving away from their traditional base of clothing etc. But this has been loss making for sometime so it can only be a good thing. blythburgh wrote: M and S to close or convert to food only shops. Wonder if ours will survive? Not a shop I ever use or care about. Overpriced in every way. If you are thinking about the effect on the High Street then as I have said before it has evolved and is continuing to evolve. The effect on jobs? We continue to have good rates of employment with another reduction in unemployment announced recently. Do we need a High Street in the future? Last edited by William Joseph1 on Tue May 22, 2018 3:31 pm, edited 1 time in total. William Joseph1 wrote: Frightening Why? Not a shop I ever use or care about. Overpriced in every way. Yes, rarely use it these days - so many better alternatives! Sandwiches are still good quality and their custard tarts are better than the alternatives...... but not worth a visit for those alone. Also, I hate their "chop and change" attitude in food. You just get used to something and.... they stop it. Tough.